Picking on a topical issue as the "poster child" for a referendum campaign is a hugely risky strategy, and especially so if you are expecting a long campaign when circumstances are likely to change. This looks like being the case with migration, and in particular the Mediterranean crisis which has been dominating the headlines over the summer. As the crisis has developed, it has been gleefully exploited by divers anti-EU groups as an example of the inadequacy of Union policy-making and delivery. An example of this could be seen in the European Parliament yesterday when Nigel Farage responded to a joint address on the migration issue by Hollande and Merkel. This was the first joint Frenco-German speech to the European Parliament since Mitterrand and Kohl spoke in November 1989, which had Merkle describe the migration crisis as a test of historic proportions. Said Mr Farage: "In what must count as perhaps the worst piece of public policy seen in modern Europe for half a century ... you compounded the already failing and flawed EU common asylum policy by saying to the whole world: 'Please come to Europe'. And we saw, frankly, virtually a stampede. And we learn that 80 percent of those who are coming are not Syrian refugees". But what is undoubtedly a major problem for the EU now has the full attention of the "colleagues", and could be on its way to being resolved. If that is the case, it would create a serious problem for the anti-EU campaigns. The solutions will be cited as an example of the countries of "Europe" successfully working together, turning a campaign asset into a liability. More astute campaigners have always seen this as a possibility. 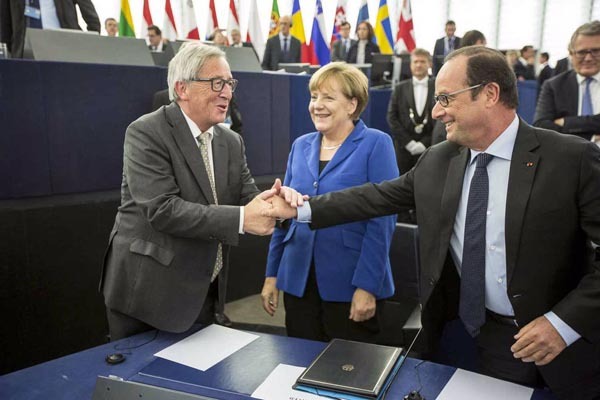 Even though the situation is getting increasingly difficult for Merkel, and dire predictions are to be found in the legacy media, the European Commission is already parading its solutions to the Syrian and Iraqi component of the crisis. Its latest plan is set out in a Draft Action Plan, "Stepping up EU-Turkey cooperation on support of refugees and migration management". Amongst other things, the EU intends to "mobilise" €1 billion in funds to help Turkey increase the scale of humanitarian assistance it is providing, adding to the € 4.2 billion already "mobilised". Turkey is also set to benefit from a substantial increase of the EU Regional Trust Fund, which could account for billions more. Some of the money will be used to support resettlement schemes and programmes, enabling refugees in Turkey to enter the EU in an orderly manner. And in exchange for this largesse, Turkey has promised to "continue and further enhance" the effective implementation of the law on foreigners and international protection by adopting necessary secondary legislation and raising awareness of its content among all parties concerned. It will ensure that migrants are registered and provided with appropriate documents on a compulsory basis to enable to build a stronger migration management strategy and system. And it will ensure that the asylum procedures that have been initiated are completed, so that the status of refugee is granted without delay to those whose asylum requests are positively assessed. If this is dry-as-dust stuff, as always with the EU the devil is in the detail. Even though the BBC downplays the deal, Turkey and the EU are continuing talks on what is opaquely labelled the "visa liberalisation dialogue", incorporating "the visa roadmap and the provisions of the EU-Turkey readmission agreement". Almost entirely unreported by the UK media (along with so much else), this cropped up in December 2013, when the readmission agreement took a step forward when it was signed by EU Commissioner for Home Affairs Cecilia Malmstrom and Turkish Foreign Minister Ahmet Davutoglu. The essence of the agreement was that the Turkish government would undertake to accept the return of irregular migrants who had used Turkey as their country of passage en route to Europe, thereby overcoming one of the greatest problems encountered by reception countries – the absence of a "safe" country that would take them back. This was ratified by the Turkish Parliament in June 2014, paving the way for visa-free travel to Schengen area countries for Turkish citizens. Coming into force three years after ratification, this is the turnkey that facilitates the readmission agreement. Although we are not fully there yet, the current "Draft Action Plan" is another significant step forward which promises to reduce significantly the flow of irregular migrants coming out of Turkey. This, though, is by no means the extent of the EU activity. We learn from the Times that EU Member States are planning the mass deportation of "hundreds of thousands of failed asylum seekers", after pressure has been applied to countries such as Niger and Eritrea, who have hitherto refuse to take back migrants. Human Rights Watch is not happy, complaining that EU is intent on shifting its responsibilities toward refugees and asylum seekers to its neighbours, while the UNHCR fears that refugee reception centres set up with the aid of EU money will end up as detention camps. But the agency also notes that the returns are due to start extremely rapidly, with Italy planning to start relocating refugees - a group of Eritreans – as early as Friday. This stems from a European Commission initiative taken on 9 September, when it noted that in 2014 less than 40 percent of the irregular migrants that were ordered to leave the EU actually departed. With the Commission having been "invited" by the European Council "to set up a dedicated European Return Programme", this is one of the first visible results. Following the Merkel-Hollande address, we can expect even more. And some of that will follow from the High Level Conference scheduled today, while the EU's operation against people smugglers may reap additional dividends. Despite the media only just beginning to notice, these measures have been under development for some time and, as they gather momentum, their effects will intensify. Given also a favourable change in the military situation in Syria, perhaps as a result of Russian intervention, it is not untoward to speculate that, by the time we head to the polls, the migrant crisis that has been preoccupying us for so long will have disappeared from the headlines. That is not to say that the problems (any of them) will have been solved. The EU doesn't work that way. But the federal boot may have kicked them into some exceeding long grass – sufficient to neutralise them as a referendum issue. There is, of course, always the possibility of the alternative scenario, where the problems spiral out of control, to a greater extent than they have already. If that happens, they will be a powerful asset to the "leave" campaign, without us having to labour the points. And on that basis, there is no great advantage in pressing buttons right now. Since there are some potentially serious disadvantages, and it is never a good idea to put all your campaigning eggs in one basket, it would seem that caution is advised. We should think twice, and think again before using migration as a "killer issue" in our toolkit. A two-year campaign has different dynamics to a short fight, and we need to be thinking not of the present but of what will be playing when the votes are cast. And then migration may no longer be on the agenda to the same extent that it is now.